There is something rotten in the air of Craw County. There was decades ago, when Earl Tubb left for Vietnam: a football hero, and the son of a father famous for his skirmish with a crew of assailants, armed only with a baseball bat. Back then, Earl ran away; not his problem, and even it was, he wasn’t the solution. But things have changed, and this time Earl has identified the core of the degradation: the enigmatic football coach, who casts a long, dark shadow over the down. This time, Earl doesn’t run away. And the consequences are catastrophic. SOUTHERN BASTARDS presents the south exactly as its feared. It’s dirty, gritty, and unwelcoming to outsiders; both in appearance, and its populace. Collaborators Jason Aaron and Jason Latour play up the stereotypes without dipping into parody. It’s a fine line. The characters are all gnarled and grizzled, scowls permanently etched on their faces, even when they’re smiling. But there’s a beauty to that ugliness, Latour’s talent on full display as he depicts these characters and their world. You’ll never want to set foot in Craw County, but you won’t be able to look away from it. The plot seems formulaic at first: a man enters a small town, spots injustice, and ends it. Seen it before, a hundred times, right? But there’s more to it than that. Much more. 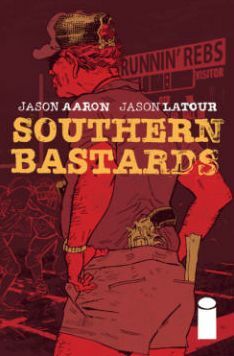 And by end of this first volume, THERE WAS A MAN, readers will understand SOUTHERN BASTARDS is set to be as epic in scope as Aaron’s SCALPED, if not more so. And as s far as last-page reveals go, this is one of the best in recent memory. Kudos to the best Jason’s working in comics. I’m along for the ride.